Tide (the American laundry detergent brand) have had a hard time of it recently. The ‘Tide Pod challenge’ became the fastest route to the hospital for teenagers and the fastest route to negative headlines for the brand in recent weeks. However, the multiple health and safety warnings they’ve published haven’t numbed their sense of humour and their Super Bowl ad was proof of this. With the help of 'Stranger Things’ David Harbour – they parodied the usual gamut of ads that fill the Super Bowl ad spots – by claiming that essentially every ad on TV was an ad for Tide Laundry Products (rarely does anyone look scruffy on TV). 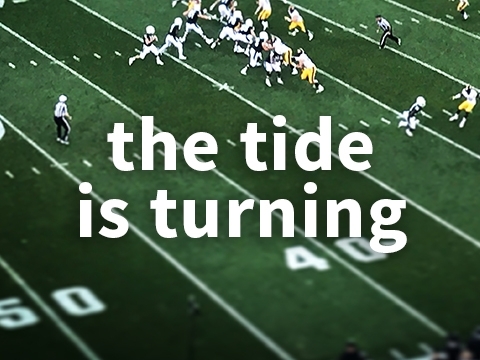 They filled the ad spaces throughout the evening with 10 second spots that subverted the type of ad viewers were used to seeing during the superbowl, and instead... well "It's a Tide ad"
And that's what made it so funny, viewers are used to indulging on sumptuous, all-singing, all-dancing, visually assaulting ads during the big game. Sleek cars, famous actors, dialogue heavy opuses all shot like big budget movies. But they aren't used to ALL (well nearly all) these ads being for the same product. It's a heck of a way to nail through millions of dollars, but guess what? It worked, and no-one's talking eating laundry detergent capsules anymore. Other ads that deserve a nod this year include the Doritos/Mountain Dew mash-up; featuring a medley of superstars. I couldn't tell you what it was really about, but it's memorable and sometimes that's all that matters. Another shout-out goes to the Australia Tourism board for their Crocodile Dundee inspired film trailer featuring Chris Hemsworth, a buffalo, and some classic movie lines. The overwhelming take out is that the more successful ads broke the fourth wall repeatedly. And constantly referred to the ads being ads.